Haddonfield’s Colette Oswald photography and Lisa Michaels Salon recently partnered to provide the girls of Grace in the Mud the unique opportunity of a small makeover and photo shoot, teaching the girls about their jobs as well as making them feel beautiful for who they are. Grace in the Mud, Inc., a Cherry Hill non-profit, is dedicated to empower girls through positive identity formation, character development and community service connections as they approach one of the most difficult and rapidly changing times in their overall development as women: adolescence. To this end, Grace in the Mud has partnered with many community business owners and professionals to provide unique and meaningful learning experiences outside the classroom, with the hope of improving the trajectory of the girls’ future choices. 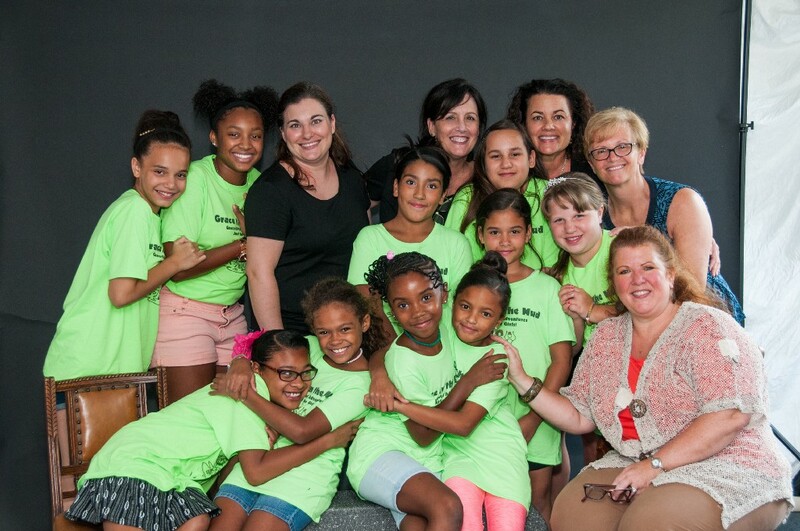 Haddonfield’s Colette Oswald photography and Lisa Michaels Salon recently provided the girls of Grace in the Mud the unique opportunity of a small makeover and photo shoot. The objective was to teach the girls about their jobs as female business owners, as well as make them feel beautiful for who they are. “I was really happy to hear that they have this program for young girls… I remembered what it was like for me being a little girl and in my life I can remember (one time) that anyone said anything really positive to me (in my adolescence)… To this day I remember how big that was. So I welcome the chance to lift them up a little and encourage them, and make them feel good about themselves,” Lisa Michaels said. Colette Oswald and Donna Romani-Kane, founder of Grace in the Mud, made a connection at a networking event, where Romani-Kane asked Oswald to talk to the girls about being a female business owner and photographer. Oswald, being a business owner on Tanner Street for 20 years, loved the idea, but thought why not take it a step further and do a little photo shoot for each of the girls? Oswald invited Michaels, also a business owner in Haddonfield for 15 years, to do a little primping of the girls before their portrait was taken. Aaliyah of Grace in the Mud sits with a simple black background and tank top to show off her beauty during a photo shoot provided by Colette Oswald, right, and styling by Lisa Michaels. This was through a partnership with Grace in the Mud and the Haddonfield business owners, to provide the girls a unique and meaningful learning experience that they otherwise may not have gotten. “(We wanted to do portraits) of the girls so they’ll have something to remember the day by, but also, being photographed can be such an empowering experience,” Oswald said. “It is important to look at positive identity formation and to appreciate how we look and feel beautiful, to see ourselves in that light. So this should be a reflection of our true beauty. I couldn’t think of a better way to do this,” Romani-Kane said. For the photos, Oswald wanted to keep things simple and elegant. Each of the girls wore a black tank top and sat in front of a black background. Only a touch of makeup and an easy hairstyle were given to the girls. This was so they can be their natural selves, but also feel beautiful and empowered by the photo shoot. “I don’t know how many of these girls are getting the chance to present themselves the way they’d like to… this gives them the opportunity to dream bigger,” Oswald and Michaels said, combining their thoughts. That is the big focus of Grace in the Mud. Program curriculums are uniquely designed with the girls’ interests in mind with a primary focus on inspiring passion to drive perseverance (AKA: grit). Programs encourage fun and inclusive opportunities for young girls and their families to connect with mentors from all walks of life, creating community relationships that will promote the safe and healthy realization of each participant’s limitless potentials. Each of the girls said this was the first time they experienced a photo shoot like this and expressed their thoughts, saying it made them feel confident, excited and was overall fun. “I felt special getting my makeup done,” Emily said. Romani-Kane said Grace in the Mud would love to expand its reach, however it needs the help of the community. They accept financial and in-kind donations, and if individuals, business owners or organizations have an opportunity to teach the girls something, they too may offer that service as well. All Grace in the Mud would like is the opportunity to give young, at-risk girls the chance to blossom. To learn more about Grace in the Mud or to donate to help provide young girls opportunities such as this in the future, visit www.graceinthemud.org.